Newspaper Rock: Yum Yum revives "little Indian"
Yum Yum returns the "little Indian"
By Isabelle MasséDuring a fall, Chips Yum Yum back to the forefront of its bags of chips Nature and BBQ's "famous Indian" less visible on the packaging in the late 90s. Go back is betting the company has done Warwick to attract attention. The new bags are inspired by the graphics of the 60s. "The vintage trend is in many areas, note the marketing director, Renee-Maude Jalbert. It was launched in 2009 vintage packaging for our 50th anniversary with success. We wanted to ride all year round and the bags have gone faster." In time for the start of the holiday season, the company has brought to market hundreds of thousands of bags of 400 g, instead of the traditional 235 g. Due to the positive response from retailers, the company was able to add 150 stores to its already expanded to several hundred outlets distribution. "The Nature and BBQ flavors remain the two most popular on the market, notes Renee-Maude Jalbert. 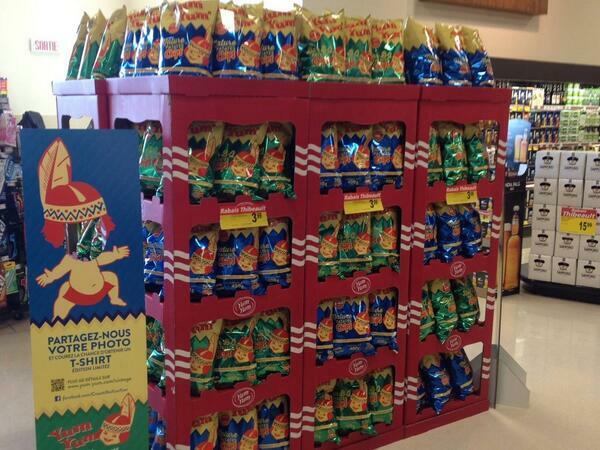 And we see an increase in sales of chips during the holiday season, compared to other months of the year, about 20%." "This is a very important offensive to us in terms of image and marketing," says Valérie Jalbert, CEO of Yum Yum Chips and Krispy Kernels. It plans to sell more, even if we do not talk about planned special sales. "Comment: You gotta love the phrase about "offensive marketing." Yep, this is offensive marketing, all right. 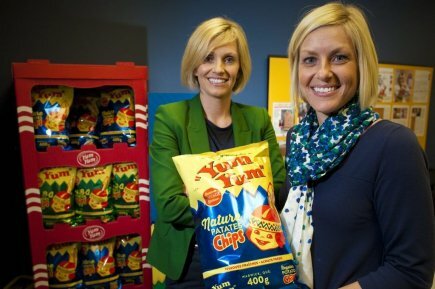 Below: "Valérie Jalbert, CEO of Yum Yum Chips and Krispy Kernels, and Renee-Maude Jalbert, marketing director."